So after last week’s reflective post its right back down to business. Today I am writing on a topic that is very near and dear to my heart. Evangelism is one of the few topics in today’s church that is given a decent amount of sermon time. So…if it is covered…why am I writing about it today? Well, as you’ve likely recognized from the title of this post already…it’s because we’re doing it wrong. 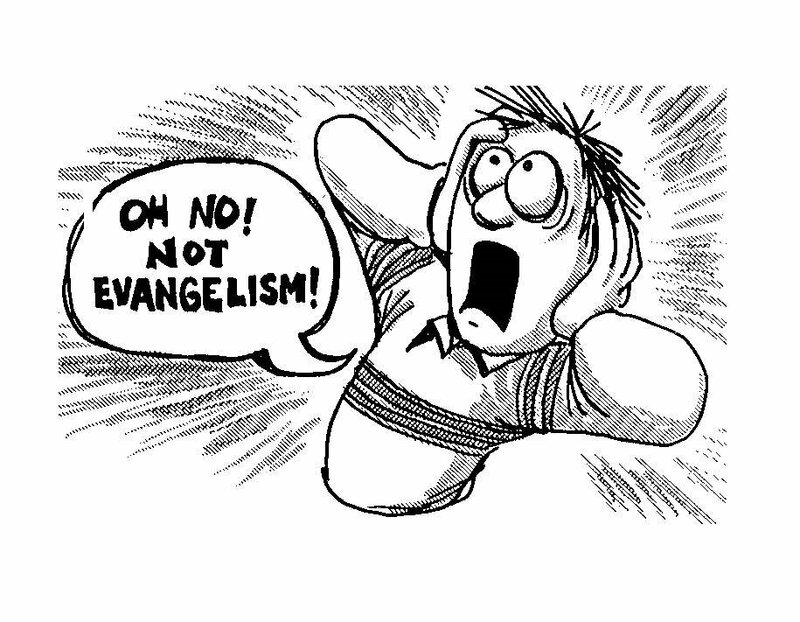 Evangelism is a tricky topic…mostly because people don’t really know what it is. So this post is going to explore that question as well as how evangelism relates to the everyday believer. If you asked the regular nominal Christian if evangelism is important (especially evangelicals) a likely answer will be yes. This is a good thing…as not even 15-20 years ago that was a serious question being asked in many churches. But, and here is where the rubber meets the road for me, most Christians don’t live their lives in light of this truth. Evangelism certainly isn’t the only topic we do this on…but it is one of the most easily seen. Unpacking this word its means and importance for the church is an undertaking, so without going into a tangent (which is likely to occur anyway so bear with me). First, let’s start with what evangelism is not. Evangelism is not a Billy Graham crusade…now don’t get me wrong…this is not a bash on Billy Graham. Reverend Graham is a man I respect and admire for his service to the Kingdom of Heaven. He is a man that I find inspirational, wise, and incredibly blessed…however while his model of ministry worked for him…it is not a model of ministry that we see within the pages of the biblical text. Sure, Peter spoke to a large crowd and 3000 came to Christ…but how many times do we see this happen within the Scriptures, maybe one or two other times? Evangelism is not a “calling” like pastor/elder ministry is. It is not a thing meant only for a few while the rest gather and hand over people who are interested. Evangelism is not the acquisition of “converts”. So then, if evangelism is none of the above than what is it? Well first, I want to make a distinction. Evangelism and evangelist are not synonymous with one another…in fact the Greek word has little to do with the modern definition and use of the word. An evangelist in the ancient church was a person who preached and carried the Gospel to other peoples; today we call this a missionary. Today’s use of the word has developed beyond that into a concept related to what it means to spread the gospel wherever a person is. In this way, it has become a study of how to do this and what it means to do this within a modern context. Now that this distinction is made when I say that “evangelism is not a spiritual gift,” I am referring to evangelism as we see it today, not an evangelist who is clearly called and gifted accordingly. The two are related, but are not the same…if this distinction is not made than confusion is proficient and endless and that is something I am hoping to avoid by drawing this conclusion. Evangelism then is one person speaking to another person about Jesus who doesn’t know Jesus…yes it really is that simple. See we like to…confuse terms and make it impossible to understand something simply because…well then we would actually have to do stuff instead of sitting in a room arguing about the meaning of a word. But enough of that…let me point to Jesus and show you who had has “called” to evangelize and what that means. The verse I am about to use is not new…in fact most Christians who see this verse are likely to roll their eyes they’ve heard it read, recited, and referenced so many times. So let’s just go to the text and see what it says. Now, like I said this isn’t new…but let me point to a few things you might not have seen before. Jesus prefaces his command with a statement regarding his own authority. In this, he is reminding us who he is and who is giving this mission. He has been given all authority, power, might, and rule in heaven and over the whole of the earth. He is no longer the carpenter from Nazareth…but the King over all creation. So with this ultimate authority he gives us this charge. The next thing he says is the word “go”. Oh, how many Christians wish this little verb didn’t exist! Notice here…we are called to go…not bring. Instead of being Jesus in a broken world, we bring broken people into the church building to “meet” Jesus and a spiritual leader, people who are far more qualified than we are. My personal favorite for why this happens is because certain people aren’t “called” to evangelize. God is my witness, if you just read the words of Jesus than you are called to evangelism. Christ includes every Christian in the activity of evangelism, not a select few! It is not a spiritual gift, or a vocational calling. It is a command and a behavior to be practiced day in and day out. So, we are ALL called to go but go and do what? We are called to “make” disciples…notice we aren’t called to make converts (sorry hand raising evangelism guy…you’re doing it wrong). No, we are called to make disciples…men and women dedicated to the purpose, meaning, and intent of the cross for all humanity. Anything less than this is a mockery of the faith that we profess to hold. These words come from the mouth of Jesus himself…so why are we so negligent? Why do we make a mockery of the faith by taking anything less than a disciple for Christ? Because Jesus told us to make disciples…and if we love him than we will obey him (John 14:15). We are to teach them about Jesus and his commands for us…but we aren’t in it alone. While this task is daunting it is not a task that we do under our own power. Earlier Jesus professed his authority, now he is going to show how that authority is being put to work for us to our advantage. Jesus promises that he will be with us always. This is an always used in the most emphatic way possible. Jesus is with us when we are happy, when we mourn, when we get up and when we lay down. He is with us when we are nervous, when we face our greatest fears, and when we commit those “secret” sins that no one else knows about. He walks through it all with us…never leaving our side no matter how much we deserve it. He has chosen to be intimately involved in our lives. Why does this matter for evangelism, because it means that you are not alone. Your Lord, Master, Savior, King, and Friend is right there holding your hand throughout the entire process. You are never in it alone…not ever. This is why every Christian is capable of evangelism. We all have God dwelling within us, interacting with us in relationship. Do you know every verse, or can you explain why you think evolution is a crock…no…but it doesn’t matter. Christianity is about relationship so share that with people. Tell them who Jesus is to you and what it means to be a Christian every day. Show them by making the proper hard choices that Jesus is real and if they mock and scoff at you…well then you can head in the opposite direction. Evangelism is about living life with other people, them seeing Jesus work in your life, and you speaking to them about who he is. Evangelism is a personal responsibility, not the responsibility of your pastor or church. It is your responsibility…get out there and start fulfilling that calling. If this makes you uncomfortable…if you are getting a shiver down your spine at the slightest thought of sharing Jesus than let me suggest that you do two things. Number one…think on the discomfort of flails ripping your flesh, and number two…think on the discomfort of nails through hands and feet. Jesus has done much for us…more than we could ever do for him…he is worth your discomfort, so get out there love people and create opportunities to tell them about who He is and what he has done in your life. You never know…you may find that it’s not as scary as you think. Peace and Blessings and as always thank you for reading.